Ty the Tasmanian Tiger is a series very special to me. As a child the series was my second most-played single player experience, only to be surpassed by Super Mario Sunshine. The three games had a great emphasis on Australian culture and the graphics looked straight out of a comic book. Over-the-top cheesy cinematics and voice acting was the icing on the cake. However, the first three Ty games were 3-D platformers; Boomerang Blast is not. In celebration of Ty's 10th birthday, Krome Studios comes back from the dead to bring us a beautiful on-rails shooter for iOS that perfectly captures the look and feel of the original games while bringing something totally new to the table. 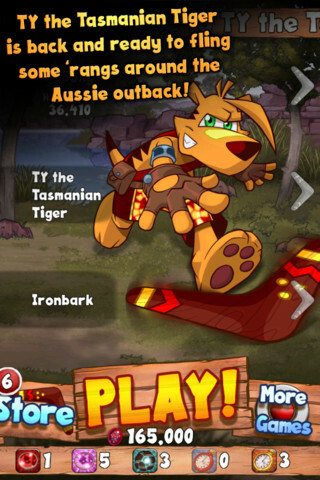 Packed with hours of addictive gameplay, Ty the Tasmanian Tiger: Boomerang Blast is a great game that will give you your Ty fix in anticipation for whatever the future of the series may hold. The real question is, does the game offer enough content to compete with other endless score-based games like Jetpack Joyride, or will it grow stale overtime? Played from a first-person view, Boomerang Blast boasts gorgeous hand drawn graphics optimized for the retina display. The result is one of the best looking games on iOS from an artistic standpoint. Steve Stamatiadis' signature cartoony style, most recently seen in Krome's Blade Kitten back in 2010, returns at its best. The game openly embraces every Australian stereotype, giving it a light-hearted feel that immediately puts a smile on your face. Sound effects that bring you back to the days of the arcade are bundled with these outstanding visuals and the series' catchy theme song returns upon boot-up. So how's it play? The core experience is great. You throw your boomerangs with the flick of a finger and they can curve to your liking. The fancier the better as you are rewarded bonus points for pulling off curve shots and shots from behind. The game runs smoothly and is easily controlled with just one finger. 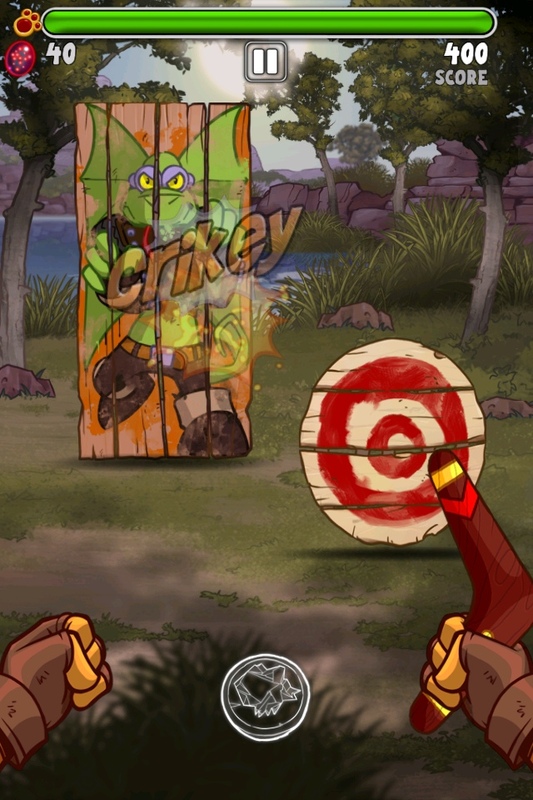 Enemies come in the form of painted boards and targets that must be destroyed. Breaking a target earns you a certain amount of opals depending on the type of enemy. 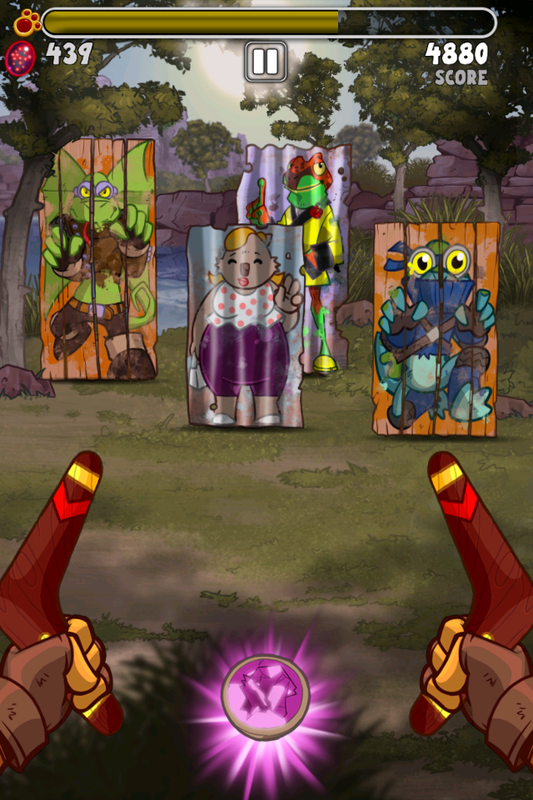 Opals can be spent to buy new boomerangs such as the flamerang, a veteran of the series, which can blows up on impact and destroys nearby enemies. Other levels, characters, and items can also be purchased with opals. Don't think opals are easy to come by though. While the average price for something in the shop is around 10,000 opals you generally only earn around 200 opals per game. The standard game lasts around 2-4 minutes with the difficulty increasing the longer you survive. Despite opals being hard to obtain, you will gradually collect them because this game pulls you in and never lets you go. Like any good mobile game, Boomerang Blast is extremely addicting. You have a health bar that depletes when you hit a friendly that pops on screen or when you let an enemy escape the screen. Not too hard at first but as things speed up you will be frantically swiping your finger all over the touchscreen. Fast paced gameplay defines Boomerang Blast. The game is designed for short but very enjoyable play sessions. Each round you play starts off with plenty of action and gets more exciting from there. With plenty of opals to be earned and very fun arcade gameplay, it is hard to stop playing Boomerang Blast. That is not to say it is perfect though. You will get bored after a while because you will get a vague feeling of repetition. Yes, every time you play you are getting a new randomly generated experience but the game still does not offer quite enough. It would have been nice to include more things to actually shoot at. There were several times where the game really had my blood pumping as I killed the last enemy on screen, but then I would have to wait two or three seconds for the next enemy to show up. What could have fixed this would have been adding randomly appearing power ups like double points or slowing time. Another nice feature would have been a combo system. No matter how many hits you chain together there are no combos in this game at all. Missing a boomerang throw has no penalty other than having to wait for the rang to return to you. Small additions could infinitely expand the lifetime of this already great game. The items you can purchase do help add another factor to the gameplay but nothing too drastic. Clearing the screen of enemies is nice, as well as getting some extra time after depleting your life bar, but these items from the in-game shop do not do enough to shake the feeling that Bomerang Blast chooses style over substance. Most disappointing is that unlockable characters are purely aesthetic. A nice aesthetic indeed, but again the feeling of style over substance is re-enforced. Buying anything within the game in general would be much better if the menu of the shop was more responsive. Almost every time I opened the menu of the shop I was treated to extreme lag. I never had the app crash on me, though it would take multiple taps of a button and several seconds of waiting to get anything to work. This issue was only encountered in the menu of the shops, but it was so bad that when I made an in-app purchase I almost accidentally made a second one. At the time of this review there has not been an update to remedy this problem. The app was running on a 4th generation iPod Touch with iOS 6 updated to the most recent version and the rest of the game functioned flawlessly. Mobile games exist to be fast, addictive escapes from reality. Boomerang Blast excels in gameplay and visuals but lacks in content. Laggy menus further cripple this near-perfect game. Even with its flaws Boomerang Blast is very kind to the canon and will please not just fans of Ty the Tasmanian Tiger, but anyone looking for a highly addictive and ridiculously fun mobile app.